Pro-democracy lawmakers have decided to boycott the Legislative Council's upcoming trip to the Yangtze River Delta region to protest against the proposed amendment to the extradition laws. Seven of them - Alvin Yeung Ngok-kiu from the Civic Party, Charles Mok, Kenneth Leung Kai-cheong and Ip Kin-yuen from the Professionals Guild, and the Democratic Party's Andrew Wan Siu-kin, Helena Wong Pik-wan and Lam Cheuk-ting - applied to go on the four-day trip earlier, but announced that they would be withdrawing their names, saying the current political atmosphere is not suitable for them to make a visit. The trip, scheduled from April 21 to April 25, is a duty visit to Shanghai and Hangzhou for lawmakers to understand more about the economic and financial related development in the Yangtze River Delta region. It is a joint-panel duty trip by the Panel on Economic Development, Panel on Commerce and Industry and Panel on Information Technology and Broadcasting. The seven legislators told reporters they changed their minds yesterday, saying the decision was made after a serious discussion with other lawmakers in the pro-democracy camp. Yeung said the proposed fugitive amendment bill was the main factor that makes it bad timing to visit the mainland, adding that the government has been arrogant and unwilling throughout the fugitive controversy. Wong said the government had not proposed amending the bill when she applied to go on the trip. But now, it is more important for lawmakers to stay in Hong Kong to handle the amendment bill and express citizens' concerns than go on a trip about innovative development in the mainland. She also asked the Constitutional and Mainland Affairs Bureau whether they can meet officials from the Chinese government to discuss the extradition controversy, but has yet to receive a reply. 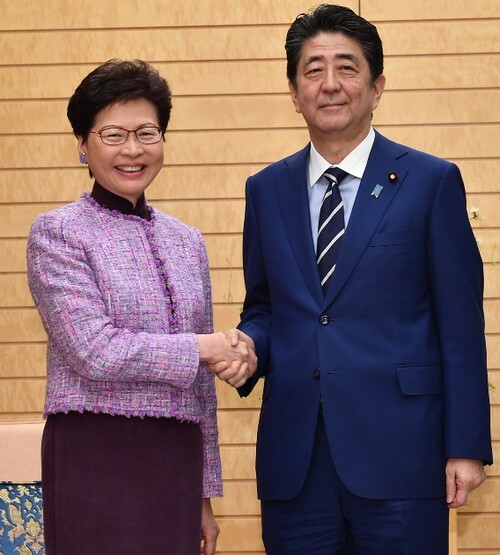 In a separate event, Chief Executive Carrie Lam Cheng Yuet-ngor met Japanese Prime Minister Shinzo Abe and attended the Symposium on the Guangdong-Hong Kong-Macau Greater Bay Area, jointly organized by the governments of Guangdong, Hong Kong and Macau in Tokyo yesterday. Lam told Abe she was pleased to see more than 1,000 people having participated in the symposium, saying it is a testimony to the interest of many Japanese enterprises and people, by participating in the development of the Greater Bay Area. She also said Hong Kong and Japan enjoy close ties in trade, economic affairs and people-to-people exchanges, and added that both places could further enhance cooperation on elderly care services. Lam also delivered a keynote speech at the symposium to introduce Hong Kong's role in the Greater Bay Area.